CLAHRC East of England is a partnership between the University of Cambridge, the University of East Anglia and the University of Hertfordshire. CLAHRC East of England Director, Professor Peter Jones, is based in Cambridge, as are theme leads Professor Carol Brayne, Professor Tony Holland and Professor John Clarkson. Professor Fiona Poland and Professor Garry Barton are based in Norwich and Dr Elspeth Mathie (PPI research theme co-lead) is based at the University of Hertfordshire. The CLAHRC Director is supported by three deputy directors, Professor Eneida Mioishi (based at UEA), Professor Claire Goodman (based at University of Hertfordshire) and Dr Christine Hill (based in Cambridge). The CLAHRC Business and Operations Manager, Ms Angela Browne is based in Cambridge. The Management Executive Group (Director, 3 deputy directors (UC, UEA and UH) and CLAHRC Business and Ops Manager) meet on a weekly basis to discuss operational and financial management issues. The CLAHRC East of England Board is responsible for financial scrutiny and approval of the overall strategy of the CLAHRC. 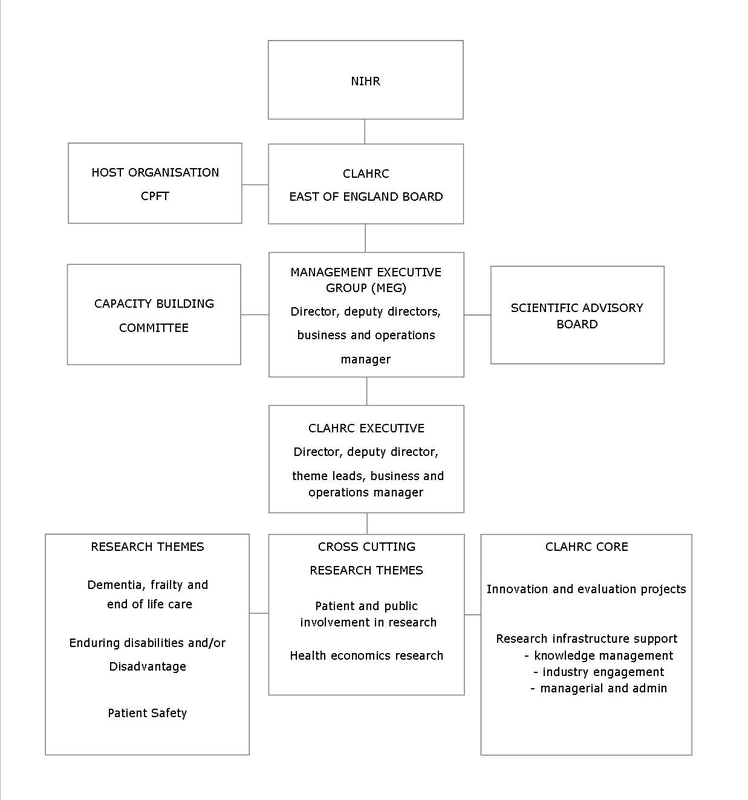 The Board provides high level input to the CLAHRC’s strategic and business plan and meets twice a year. The Board Chairman is Stephen Thornton CBE. the adoption of future research or implementation themes. The SAB is chaired by Dame Jessica Corner; membership of the group includes independent experts, senior CLAHRC members, and a patient and public representative. You can find the Boardmembers of the SAB here.